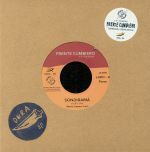 Review: It's a while since we heard from contemporary cumbia stars Frente Cumbiero, who found fame earlier in the decade with a string of singles and an album length dub revision of their work by British soundsystem hero Mad Professor. They kick of their first single in six years with "Sondirama", a jaunty and restless affair rich in rasping horn lines, mazy 1970s Moog synthesizer sounds, lilting Latin trumpet, incessant organ stabs and the band's omnipresent Colombian style beats. It's rather good, all told, as is the rather more eccentric B-side, "Crema Mental", which sees them pepper a dense, off-kilter tropical rhythm with tango style accordions, trip-inducing synthesizer solos and marching brass stabs.